Have you distributed Health Insurance Marketplace Notices yet? By October 1, 2013 most employers must deliver written notices with details about health insurance marketplaces (formerly known as exchanges) to all employees. Also effective on that date is the requirement that notices be given to new hires within 14 days of their start date. The rule applies to employers covered by the FLSA. In general, the FLSA applies to employers that have (a) one or more employees who are engaged in commerce AND (b) gross annual sales of $500,000 or more. The FLSA is enforced by the Department of Labor (DOL), which has guidance relating to the applicability of the FLSA in general including a compliance assistance tool to determine applicability of the FLSA at www.dol.gov/elaws/esa/flsa/scope/screen24.asp. A detailed discussion of the FLSA is beyond the scope of this email. To learn more about this requirement, read these. 1. To whom must the marketplace notices be distributed? Employers must provide a marketplace notice to each employee, regardless of plan eligibility or enrollment status, part-time or full-time status, or status as a regular, temporary or seasonal employee. Employers are not required to provide separate notices to dependents or other individuals who are or may become eligible for coverage under the plan but who are not employees, such as independent contractors, retirees, partners, etc. 2. When do I have to distribute the marketplace notice? Employers are required to provide the marketplace notice to each employee by October 1, 2013. For employees hired after that date, the employer must provide the notice within 14 days of the employee’s start date. After October 1, 2013, experts believe employers will include the notice in new hire packets. 3. There are multiple model marketplace notices, so which notice do I use? There is one model notice for employers who do not offer a health plan, available here. This includes instances where the only health plan available to its employees is offered by a union, even though the employer makes contributions on behalf of the employees. There is another model for employers who offer a health plan to some or all employees, available here. This means that even if you offer benefits to only a certain class of employees, you would still use this model notice. 4. What name, EIN, telephone number and address do I use if my organization is part of a controlled group of businesses? Sections 3 through 9 of the model notice require information about the employer. Since distributing the notice is an employer obligation, not an ERISA plan obligation, each employer within a controlled group of companies is required to distribute the notice to its own employees under its own name, EIN, telephone number and address. The contact information contained in sections 10 through 12 of the model notice may be different and may relate to whoever can answer questions about employee health coverage, such as the plan sponsor. 5. Should I complete the optional sections 13 through 16 on page 3 of the model notice? 6. What are the penalties for not distributing the marketplace notice? As of the date of this publication, there are no penalties described by the government for failure to provide the marketplace notice to employees. It is possible that, if an employer fails to supply the notice and, as a result, an employee fails to take advantage of marketplace-based coverage, the employee might seek redress from the employer. In any case, providing these notices can only help your employees feel more informed about the changing health care landscape. Learn more about the marketplace notices at the Department of Labor website. Congratulations on your forthcoming marriage! While your biggest financial concern these days may be wedding costs, marriage introduces several potential money complications. Be sure to discuss the following subjects, as applicable, with your betrothed before you tie the knot. Credit and debt. Do you know your future spouse’s credit score? Or how much consumer debt he or she carries? Once you’re married, your spouse’s financial history can affect your ability to qualify for a mortgage and make other major joint purchases. So exchange credit reports and come clean on any money-related “secrets” now. Marriage penalty. If both you and your new spouse work, marriage may bring a tax “penalty.” Because the middle and top tax brackets for married couples aren’t twice as big as those for singles, you might be pushed into a higher tax bracket. To help avoid this, consider taking additional tax-saving steps before year end. Prenuptial agreement. A prenuptial agreement can be a good idea for individuals with considerable wealth, ownership in a business, children from a previous marriage or family heirlooms they want to keep in the family. In a nutshell, prenups determine which property should remain separate and which should be distributed equitably (or in accordance with the laws of your state) during a divorce. QTIP trust. If you have children from a previous marriage, you may want to set up a qualified terminable interest property (QTIP) trust. A QTIP trust qualifies for the estate tax marital deduction, so any assets you transfer to it won’t be taxed on your death. The trust provides your surviving spouse with income for life, but the principal is maintained for your biological children or any other beneficiaries you name. To head off money-related conflicts, consider meeting with a financial professional to discuss how the two of you plan to combine bank accounts, share assets and investments, manage household finances and make major financial decisions. Some financial professionals specialize in premarital counseling and encourage prospective spouses to discuss such topics as financial ancestry (how their parents handled money), control issues and future wealth expectations. 1. Know yourself. Not every entrepreneur is cut out for franchise ownership. Franchises are structured systems, so owners who are willing to follow rules and listen to feedback are more likely to be successful than those who are independent and become stubborn in the face of criticism. Having a background in business operations, marketing or the military may be an advantage. 2. Be realistic about profits. Your franchise is unlikely to be profitable the first year — or even longer. Once established, franchises with higher initial investments tend to be more lucrative. According to the Franchise Business Review, the average food franchise owner pays an initial investment of $450,000 and makes $88,000 in annual profits. 3. Get expert advice. Even if you have an extensive business background, enlist the help of professional advisors. A lawyer should review your franchise agreement and a CPA should provide accounting, tax and, possibly, operations guidance. Alternative financing — Where to go when your bank says “no”. Whether you need money to start a new business, replace aging equipment, expand sales territories or acquire another company, getting a bank loan continues to be challenging. The credit market is slowly improving, but most lenders currently are asking even qualified applicants to jump through hoops — for example, to provide detailed financial projections or adhere to restrictive loan covenants. If your bank’s loan terms are unacceptable — or you are shut out of traditional lending altogether — you’re not out of luck. Consider the following alternatives. Crowdfunding involves appealing to the general public, typically via the Internet, to sell small amounts of equity in a private company. Kickstarter (http://www.kickstarter.com) is the most popular crowdfunding site, but others include Crowdfunder (http://www.crowdfunder.com), Wefunder (http://wefunder.com) and MicroVentures (http://www.microventures.com). Generally, crowdfunding best suits startups and small businesses — particularly those with strong local ties or legacies. A beloved neighborhood restaurant, for example, is likely a prime candidate for a successful run at this type of financing. When it comes to new businesses, a good back story, a strong sense of purpose and social media savvy are beneficial. An angel investor is an individual or organization that offers equity investments, loans or loan guarantees to businesses in targeted industries — generally those with which the angel investor is familiar. Several websites, including AngelList (https://angel.co) and Angel Capital Association (http://www.angelcapitalassociation.org), offer ready access to a wide variety of potential investors. This source of capital suits established small to midsize businesses that want a more substantial and long-term financing arrangement. Companies with a track record are in a better position to provide the proven business plans and sophisticated financials that angels want. However, an angel investor may seek an advisory presence in your business to mitigate risk. Although Small Business Administration (SBA) lending declined during the recent recession, the government agency is now taking steps to boost lending to smaller businesses. The SBA recently began waiving the fees it charges banks for guaranteeing loans of less than $150,000, and has streamlined the loan approval process. However, even with simpler processes in place, you’ll need to submit extensive paperwork and be prepared to explain and justify your past business decisions and future plans. Keep in mind that, to apply for an SBA loan, you must first have been turned down by a bank or other financial institution. You must also meet certain size requirements, which vary by industry, and other criteria may apply, depending on the program. Visit http://www.sba.gov for more information. Crowdfunding, angel investors and SBA loans are only a few of the alternatives to a traditional bank’s loan offerings. Other options include venture capital — where investors take a significant stake in your business in exchange for money and management advice — and asset-based financing. The latter, which is best suited to manufacturing and other hard asset–intensive companies, requires you to offer inventory or equipment as collateral. Understand that fees and interest rates for some types of alternative financing arrangements are higher than those in traditional lending. Your financial advisor can help you weigh the advantages and drawbacks of each option. Combining medical expenses. Qualified medical expenses are deductible only if they exceed an applicable floor. It’s easier to exceed this floor and deduct more expenses by bunching expenses into alternating years. For 2013, unreimbursed medical expenses are deductible only to the extent the annual total exceeds 10% of your adjusted gross income. First calculate your year-to-date medical expenses. If they exceed or are close to the 10% floor, consider bunching additional expenses into 2013. This might include scheduling dental work and buying new contact lenses in December rather than waiting until January. Making an IRA contribution. For 2013, you’re allowed to make an annual IRA contribution of $5,500 ($6,500 if you’re age 50 or older). Income-based limits may reduce or eliminate the amount of your traditional IRA contribution you can deduct or the amount you can contribute to a Roth IRA. But even nondeductible contributions to a traditional IRA may be worthwhile because the investment grows tax-deferred. IRA contribution limits don’t carry over from year to year. If you don’t make the full contribution this year, you can’t contribute a larger amount next year to make up for it. So to maximize your tax-advantaged retirement savings, make your full 2013 IRA contributions by April 15, 2014. Using your annual gift exclusion. Each year, you can gift up to the annual exclusion amount per recipient tax-free without using up any of your lifetime gift tax exemption. For 2013, the annual exclusion is generally $14,000 ($28,000 for married couples who split gifts). Like IRA contribution limits, gift exclusions don’t carry over from year to year. If, for example, you forgo an annual exclusion gift to your son this year, you can’t add $14,000 to your 2014 exclusion to make a larger tax-free gift to him next year. To qualify for the exclusion, make your annual gift by Dec. 31, 2013. Other tax-minimizing strategies may apply to your situation. To learn more, contact your tax advisor before the end of the year. Documents related to additional income (for example, compensation from consulting work, expenses from investment property and gambling winnings). Canceled, imaged or substitute checks. QuickBooks is easy to use, intuitive and flexible. But it is not an accounting manual or class or tutorial. If your business is exceptionally uncomplicated, you might get by without knowing a lot about the principles of bookkeeping. Accounts Receivable (A/R). This account tracks income that hasn’t been realized yet, like outstanding invoices. Accrual Basis. 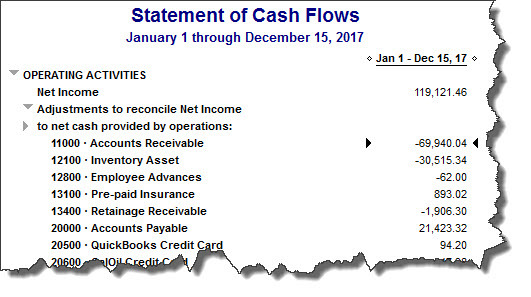 This is one of two basic accounting methods. Using it, you record income as it is invoiced, not when it’s actually received, and you records expenses like bills when you receive them. Using the other method, Cash Basis, you would report income when you receive it and expenses when you pay the bills. Average Cost. This is the inventory costing method that programs like QuickBooks Pro and Premier use to calculate the value of your stock. Double-Entry Accounting. 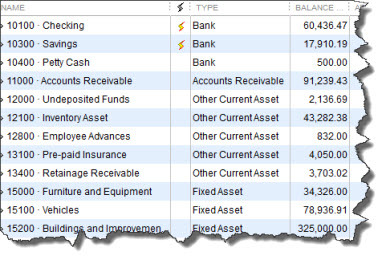 This is the system that QuickBooks uses – that all legitimate small business accounting software uses. Every transaction must show where the funds came from and where they went. Each has a Credit (decreases asset and expense accounts) and Debit(decreases liability and income accounts) which must balance out (other types of accounts can be affected).